After all that, President-elect Donald Trump remains the victor in Wisconsin. The recount, whose completion deadline was December 13, wrapped up by Monday, and has done absolutely nothing to change the final outcome of the election. The statewide recount, which Green Party candidate Jill Stein forced with a lawsuit that cost about $3.5 million, actually ended up netting the Trump-Pence ticket 131 more votes. 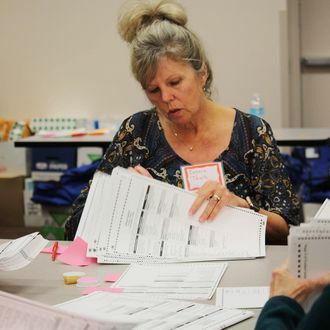 The recount did catch discrepancies on both sides — both Trump and Hillary Clinton added a few hundred ballots each — but Trump’s margin of victory in Wisconsin still stands around 22,000 votes. Stein added 66 votes to her total. Stein had also filed for recounts in Michigan and Pennsylvania — Trump beat Clinton in Michigan by 10,704 votes, and in Pennsylvania by a little more than 44,000 — but the courts halted both of those statewide recounts. Which means Stein’s efforts — for which she raised about $7.3 million — are kaput, though she is reportedly holding a call Tuesday about next steps. The Electoral College will cast its vote on December 19, and while there’s a chance for a few “faithless electors” and others who want to get their hands on that Russian intelligence briefing before making any decisions, Trump should get the more than 270 electoral votes he needs to head to the White House in about six weeks. Meanwhile, Hillary Clinton, now emerged from the woods, can watch her popular-vote lead balloon past 2.8 million.